Israeli forces continued with systematic crimes in the occupied Palestinian territory (oPt) for the week of 02-08 August, 2018. Israeli forces continued to use excessive force against Palestinian protestors in the Gaza Strip. 2 Palestinian civilians, including a child, were killed while another civilian succumbed to his pervious wounds. 99 Palestinian civilians, including 17 children, a woman and a paramedic, were wounded; 9 of them sustained serious wounds. Israeli forces continued to use lethal force against Palestinian civilians, who participated in peaceful demonstrations organized within the activities of the “Great March of Return and Breaking the Siege” in the Gaza Strip, which witnessed for the 19th week in a row peaceful demonstrations along the eastern and northern Gaza Strip border area. During the reporting period in the Gaza Strip, the Israeli forces killed 3 Palestinian civilians, including a child, while another child succumbed to his previous wounds. Moreover, the Israeli forces wounded 99 civilians, including 17 children, a woman and a paramedic. Nine of those wounded sustained serious wounds. Another civilian was wounded during launching airstrikes. In the West Bank, the Israeli forces wounded 6 civilians, including a journalist. In the Gaza Strip, on 03 August 2018, Israeli forces killed 2 Palestinian civilians, including a child, while participating in the Return and Breaking Siege March. The first civilian was killed after being hit with a live bullet that entered his chest and exited his back in eastern al-Zaytoun neighborhood, east of the Gaza Strip. The second civilian was killed after being hit with a live bullet to his abdomen, east of al-Buriej Camp in the center of the Gaza Strip. The second civilian sustained serious wounds and his death was declared on the next day. In new crime of extra-judicial execution, on 08 August 2018, Israeli forces killed a Palestinian civilian and wounded another one while targeting a civilian car carrying them by an Israeli done in the northern Gaza Strip. In the same context, on 05 August 2018, medical sources at al-Shifa Hospital in Gaza City announced the death of Ahmed Jihad Ahmed al-‘Aydi (17), from al-Zawaidah village, succumbing to his wounds during his participation in the Return demonstration, east of al-Buraij refugee camp on Friday, 30 March 2018, as he was hit with a live bullet to the head. During the reporting period, while using the excessive force against the peaceful protesters along the Gaza Strip borders, the Israeli forces wounded 99 Palestinian civilians, including 17 children, a woman and a paramedic. Nine of those wounded sustained serious wounds. As part of targeting the border areas, on 03 August 2018, Israeli forces fired an artillery shell at a border control point belonging to Palestinian armed groups while thousands of civilians participating in the March of Return and Breaking Siege activities. The point is about 300 meters into the west of the border fence with Israel, adjacent to the Return encampment, east of al-Shawkah village, east of Rafah in the southern Gaza Strip. On 04 August 2018, Israeli forces opened fire at agricultural lands adjacent to border fence, east of al-Maghazi Camp in the center of the Gaza Strip. On 08 August 2018, Israeli forces opened fire at border area adjacent to the border fence between the Gaza Strip and Israel, east of al-Zaytoun neighborhood, east of Gaza City. 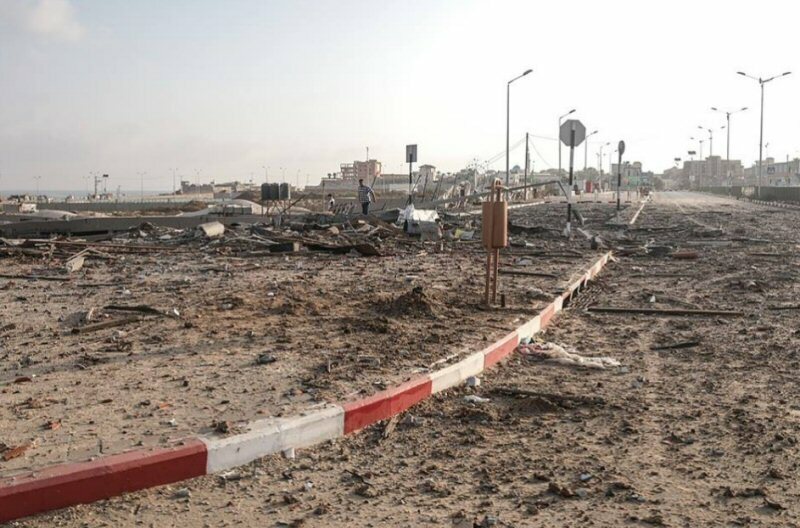 On the same day, Israeli forces fired an artillery shell at a border control point belonging to Palestinian armed groups, east of Gaza City, and no casualties were reported. As part of the airstrikes, on 04 August 2018, Israeli warplanes targeted a number of Palestinian civilians by 2 separated airstrikes while they were present in eastern Jabalia, north of the Gaza Strip, and in eastern al-Buriej Camp in the center of the Gaza Strip. No casualties were reported. The Israeli forces claimed that those young men flew incendiary kites and fired incendiary balloons at settlements near the Gaza enclave. On 08 August 2018, Israeli warplanes and drones launched airstrikes on the Gaza Strip, in which they fired 37 missiles at least. As part of targeting Palestinian fishermen in the Gaza Sea, the Israeli forces continued to escalate their attacks against the Palestinian fishermen, pointing out to the ongoing Israeli policy of targeting their livelihoods. During the reporting period, PCHR documented 7 shooting incidents at the fishermen, including 4 in the northern Gaza Strip, 2 in the centre of the Gaza Strip and 1 in the southern Gaza Strip. In the West Bank, Israeli forces wounded 6 civilians, including a journalist. During the reporting period, Israeli forces conducted at least 61 military incursions into Palestinian communities in the West Bank and 15 similar ones into Jerusalem and its suburbs. During those incursions, Israeli forces arrested at least 38 Palestinians, including 5 children and a journalist, in the West Bank. Meanwhile, 30 other civilians, including 9 children, a woman and a journalist, were arrested in Jerusalem and its suburbs. Among those arrested were Ibrahim al-Rantisi, a reporter at Turkish Channel, and Nader Bibars, a program director at Palestine T.V. . It should be noted that Ibrahim was arrested from his house in Rantees village, west of Ramallah, and Nader was also arrested from his house in Wad al-Jouz neighbourhood in the canter of occupied Jerusalem. As part of demolishing houses and civilian facilities, on 05 August 2018, Bassam ‘Obaidat was forced to self-demolish his house in ‘Obaidat neighborhood in al-Mukaber Mount, south of East Jerusalem, to implement the Israeli Municipality’s decision. Bassam 90-square -meter house was built many years ago and all his attempts to license his house failed with the Israeli municipality’s insistence to implement the demolition. On 07 August 2018, Israeli forces demolished 2 apartments belonging to Nabeel al-Mohtaseb in Shu’fat neighborhood, north of occupied East Jerusalem, under the pretext of non-licensing. The roof was comprised of 2 apartments, each of them was built on an area of 100 square meter. In the same context, Israeli military vehicles levelled a number of roads in al-‘Issawyia village, northeast of occupied East Jerusalem, as a prelude to implement the “National Parks” settlement project, which they are seeking to build there. As part of demolishing crimes, on 04 August 2018, Israeli forces levelled lands belonging to several Palestinian civilians between “Etzion” and “Alon Chivot” settlements, south of Bethlehem in favor of building a new settlement neighborhood. The lands belong to civilians, from Artas village, southwest of Bethlehem. The expansion works are part of the plan approved by the Israeli government to establish 1,700 settlement units in the area over the next five years. As part of settlers’ attacks against Palestinian civilians and their property, on 02 August 2018, a group of Israeli settlers, from “‘Ofra” settlement established on ‘Ein Yabroud village lands, east of Ramallah, punctured the tires of 10 civilians’ cars and wrote Hebrew slogans on the walls of the village. In a new crime of extrajudicial executions, Israeli forces killed a Palestinian civilian and wounded another in the northern Gaza Strip after targeting a civilian car driven by them. According to PCHR’s investigations, at approximately 23:25 on Wednesday, 08 August 2018, an Israeli drone fired a missile at a civilian car that was driving on a street in ‘Amer housing project area, southwest of Beit Lahia village in the northern Gaza Strip, as the car was carrying 2 civilians. The missile fell near the car. As a result, ‘Ali Yusuf Mohammed ‘Ali al-Ghandour (34), from Beir al-Na’jah area in Jabalia, sustained shrapnel throughout his body, most of which were in the back. Moreover, another civilian (PCHR keeps his name) was hit with a shrapnel to the right shoulder. The wounded civilians were transferred via a civilian car to the Indonesian Hospital. At approximately 23:55 on the same day. Medical sources at the hospital announced the death of al-Ghandour while classified the other civilian’s injuriy as minor. The airstrike also caused severe damage to the targeted car. It should be noted that the 2 wounded persons are civilians and the targeted area did not witness any incidents. At approximately 16:00 on Friday 03 August 2018, hundreds of civilians swarmed to the Return encampments established by the Supreme National Authority for the Great March of Return and Breaking Siege, east of Malakah intersection, east of al-Zaytoun neighborhood, east of Gaza City in the 18th consecutive Friday titled “Our Martyrs Children.” The activities included raising flags, chanting national slogans, setting fire to tires and flying kites. Though the demonstrations were fully peaceful, Israeli forces stationed behind the border fence between the Gaza Strip and Israel deliberately and randomly fired live and rubber bullets and tear gas canisters at them. As a result, Ahmed Yahiya ‘Atallah Yaghi (27), from al-Nasser neighborhood was killed after being hit with a live bullet that entered the chest and exited the back. Moreover, 29 civilians were wounded. Twenty seven of them were hit with live bullet and its shrapnel, one civilian was hit with a rubber bullet, and other civilian was hit with tear gas canister. Around the same time, hundreds of civilians swarmed to the Return encampments established by the Supreme National Authority for the Great March of Return and Breaking Siege, 400 meters away from the border fence between the Gaza Strip and Israel, east of al-Buraij in the central Gaza Strip. Dozens of them approached the border fence, set fire to tires and threw stones at Israeli soldiers stationed behind sand barriers along the border fence. The Israeli forces fired live bullets and tear gas canisters at the participants. The clashes continued until approximately 20:00 on the same day. As a result, 21 civilians, including 16 children, were wounded. Twenty of them were hit with live bullets and one civilian hit with tear gas canister. The wounded civilians were taken via ambulances belonging to Palestine Red Crescent Society (PRCS) to al-Aqsa Hospital in Deir al-Balah. Doctors classified 5 civilians’ injuries as serious and they were then transferred to al-Shifa Hospital in Gaza City. The injuries of the other wounded civilians were classified between minor and moderate. At approximately 05:00 on Saturday, 04 August 2018, medical sources at al-Shuhada’a Hospital in Deir al-Balah announced the death of Mo’ath Ziyad Ibrahim al-Suri (15), from al-Nuseirat, succumbing to wounds he sustained in his participation in the abovementioned demonstration. Mo’ath was hit with a live bullet to the abdomen. He was transferred to al-Aqsa Hospital and directly underwent a surgery. Mo’ath stayed then at the ICU until his death was announced. Around the same time, thousands of civilians, including women and children swarmed to the Return encampment, east of Khuza’ah village, east of Khan Younis, to participate in the demonstrations established by the Supreme National Authority for “the Great March of Return and Breaking Siege”. They carried out popular and heritage activities, held a wedding for two bridegrooms, chanted national slogans and flew kites and balloons as hundreds of them, including women and children, approached the border fence between the Gaza Strip and Israel and set fire. A number of them attempted to throw stones at Israeli forces. The Israeli snipers stationed behind sand barriers and hills along the border fence between the Gaza Strip and Israel, deliberately and selectively opened fire at participants, who were about 300 meters away from the main border fence and then fired tear gas canisters from military vehicles as a drone flew in the sky. The shooting continued until 20:00 on the evening. As a result, 21 civilians, including 3 children and a woman, were wounded. Sixteen of them were hit with live bullets and its shrapnel and 5 others were hit with a tear gas canister. Doctors classified 3 civilians’ injuries as serious. Moreover, dozens of civilians suffered severe tear gas inhalation and seizures due to being hit with tear gas canisters. They were taken to the field hospital and then transferred to Nasser, Gaza European and Algerian Hospitals to receive medical treatment. At approximately 16:30, hundreds of Palestinian swarmed to the Return encampments established by the Supreme National Authority for the Great March of Return, east of Abu Safiyah Hill, northeast of Jabalia hundreds of Palestinian swarmed to the Return encampments established by the Supreme National Authority for the Great March of Return, east of Abu Safiyah Hill, northeast of Jabalia in the northern Gaza Strip. The protestors raised Palestinian flags, chanted national slogans and set fire to tires. Dozens of them approached the border fence between the Gaza Strip and Israel and threw stones at Israeli soldiers stationed behind the border fence. The Israeli forces deliberately and randomly fired live and rubber bullets and tear gas canisters at them. The clashes continued until approximately 21:00 on the same day. As a result, 15 civilians, including 6 children, were wounded. Fourteen of them were hit with live bullets and its shrapnel and on civilian was hit with a tear gas canister. The wounded civilians were transferred via ambulances belonging to PRCS, Medical Services, and the Ministry of Health to the Indonesian and al-‘Awda Hospitals. Doctors classified 3 civilians’ injuries as serious. At approximately 17:00, hundreds of Palestinians swarmed to the Return encampment established by the Supreme National Authority for the Great March of Return, east of al-Shawkah village, east of Rafah in the southern Gaza Strip. A number of young men approached the border fence, flew kites, set fire to tires and threw stones at Israeli soldiers stationed behind the border fence. The soldiers sporadically fired live bullets and tear gas canisters at the protestors. The clashes continued until approximately 19:00 on the same day. As a result, 11 civilians, including a child, were wounded. Ten of them were hit with live bullets and its shrapnel and one civilian was hit with a tear gas canister. Those wounded civilians were taken to the field hospital in the Return encampment and then transferred to Abu Yusuf al-Najjar Hospital in Rafah and Gaza European Hospital in Khan Younis. Doctors classified 2 civilians’ injuries as serious. At approximately 16:00 Saturday, 04 August 2018, dozens of Palestinian children and young men gathered near the border fence between the Gaza Strip and Israel, east of al-Buraij in the central Gaza Strip, to participate in the Return encampment. They threw stones at Israeli soldiers stationed behind sand barriers along the b order fence. The soldiers fired live bullets and tear gas canisters at them. As a result, a 23-year-old civilian was hit a liv bullet to the lower limbs. He was transferred via a PRCS ambulance to al-Aqsa Hospital in Deir al-Balah. Doctors classified his injury as moderate. At approximately 17:00 on Sunday, 05 August 2018, dozens of Palestinian children and young men gathered near the border fence between the Gaza Strip and Israel, east of al-Buraij in the central Gaza Strip, to participate in the Return encampment. They threw stones at Israeli soldiers stationed behind sand barriers along the b order fence. The soldiers fired live bullets and tear gas canisters at them. The clashes continued until the evening of the same day. As a result, a 17-year-old child, a 15-year-old child and an 18-year old civilian, from al-Buraij refugee camp, were hit with live bullets to the lower limbs. They were transferred via a PRCS ambulance to al-Aqsa Hospital in Deir al-Balah. Doctors classified their injuries as moderate while one of them was transferred to al-Shifa Hospital in Gaza City. At approximately 15:00 on Monday, 06 August 2018, dozens of Palestinian children and young men gathered near the border fence between the Gaza Strip and Israel, east of al-Buraij in the central Gaza Strip, to participate in the Return encampment. They threw stones at Israeli soldiers stationed behind sand barriers along the b order fence. The soldiers fired live bullets and tear gas canisters at them. The clashes continued until the evening of the same day. As a result, a young man, from al-Nuseirat, was hit with a live bullet to the lower limbs. He was transferred to al-Aqsa Hospital in Deir al-Balah. Doctors classified his injury as moderate. At approximately 19:50 on Sunday, 05 August 2018, medical sources at al-Shifa Hospital in Gaza City announced the death of Ahmed Jihad Ahmed al-‘Aydi (17), from al-Zawidh village, succumbing to wounds he sustained during his participation in the Return demonstration, east of al-Buraij refugee camp on Friday, 30 March 2018, as he was hit with a live bullet to the head. Ahmed was admitted to many hospitals in the Gaza Strip and then transferred to Ramallah in the West Bank. He was in a state of clinical death since then until his death was announced. At approximately 13:40 on Friday, 03 August 2018, a group of Palestinian civilians moved from Kufor Qaddoum village, northeast of Qalqiliyah, to the eastern entrance to the village, which has been closed for 15 years. The protestors chanted national slogans demanding end of occupation, condemning the decisions to demolish Khan al-Ahmer Bedouin Community deport the inhabitants and condemning the Israeli forces’ crimes against Palestinian protestors along the eastern border of the Gaza Strip within “The Great March of Return and Breaking the Siege” activities. The protestors threw stones at Israeli soldiers stationed behind sand barriers. The Israeli soldiers fired live and rubber bullets, sound bombs and tear gas canisters at them. As a result, a 45-year-old civilian was hit with a rubber bullet to the right hand. Moreover, many protestors suffered tear gas inhalation. On Sunday evening, 5 August 2018, Bassam Mahmoud ‘Obaidat was forced to self-demolish his house in ‘Obaidat neighborhood in al-Mukaber Mount, south of East Jerusalem, to implement the Israeli Municipality’s decision. Bassam Obaidat said that his 90-square -meter house was built many years ago and all his attempts to license his house failed with the Israeli municipality’s insistence to implement the demolition. He also pointed out that the Israeli Municipality imposed a financial fine on him due to building his house, so he was forced to self-demolish his house to avoid paying the demolition costs. It should be noted that ‘Obaidat neighborhood was subjected to a collective punishment by the Israeli Municipality, in which it distributed demolition notices to all residents in 2017,under pretexts that the land is owned by an Israeli companغwned by an Israeli companyetextunishment e was forced to self-demolish his house y. It should be noted that a judicial ruling was issued in this case in 1985 in favor of the neighborhood’s residents, but because the neighborhood is located near “Neve Tzion” settlement, in addition to the Israeli Municipality collusion, the case is continuously being raised in order to seize the civilians’ houses in favor of the settlement. At approximately 09:00, on Tuesday, 7 August 2018, Israeli forces demolished 2 apartments belonging to Nabeel al-Mohtaseb in Shu’fat neighborhood, north of occupied East Jerusalem, under the pretext of non-licensing. Nabeel’s mother said that the Israeli forces moved into Shu’fat neighborhood and imposed a security cordon on the area. They started to demolish a roof of 2 apartments, each of them was built on an area of 100 square meter. She pointed out that the construction of the apartments took place 3 months ago and after finishing building them, the Israeli Municipality issued the self-demolition decision. The family self-demolished parts of the apartments, but was surprised with raiding the building and demolishing the apartments without a prior warning. In the same context, on Tuesday afternoon, 7 August 2018, Israeli forces levelled a number of roads in al-‘Issawyia village, northeast of occupied East Jerusalem, as a prelude to implement the “National Parks” settlement project, which they are seeking to build there. According to eyewitnesses, the Israeli forces levelled roads in the eastern part of the village, leading to agricultural lands. Those agricultural lands are threatened of confiscating and levelling in favor of the settlement project mentioned above. On Saturday morning, 4 August 2018, Israeli forces levelled lands belonging to several Palestinian civilians between “Etzion” and “Alon Chivot” settlements, south of Bethlehem in favor of building a new settlement neighborhood. Hassan Braija, Representative of the Wall and Settlement Resistance Committee in Bethlehem, said that the Israeli forces levelled Palestinian lands belonging to civilians, from Artas village, southwest of Bethlehem, adjacent to “Alon Chivot” settlement in order to establish new settlement units. He also added that the expansion works are part of the plan approved by the Israeli government to establish 1,700 settlement units in the area over the next five years. At approximately 05:00, on Thursday, 2 August 2018, a group of Israeli settlers, from “‘Ofra” settlement established on ‘Ein Yabroud village lands, east of Ramallah, punctured the tires of 10 civilians’ cars and wrote Hebrew slogans on the walls of the village. Ahmed Shehada (30), said that the Israeli settlers punctured his car tires, his brother’s car tires, Ibrahime Shehada (25), and 8 other cars belonging to the village residents.